Ballymore invented the rolling safety ladder and continues to lead the industry in innovating and introducing new products to the market. 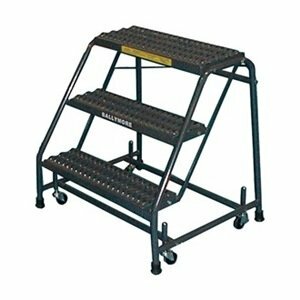 High quality 3 step ladder with great balance and grip on ground! With a base width of 30" and base length of 25" the ladder helps in maintaining your balance as you stand atop. It features 24" wide step, which assures convenience and ease as you climb up. With 28.5" top step height and 10"deep top step, you can easily reach out to things kept at a certain height without causing any damage to your posture. If you have any questions about this product by Ballymore, contact us by completing and submitting the form below. If you are looking for a specif part number, please include it with your message.